Freda Jackson works on Phillina Middleton at her business, Freda’s Skin Studio in Waynesboro. Photo by Norm Shafer. Knowing that their pre-teen and teenage daughters are beginning to be interested in makeup, mothers bring their children to Freda’s Skin Studio for education on keeping their skin more healthy than hidden. Freda has designed a makeup line named after her daughter, including only ingredients she has personally vetted, to stand by the health of young skin. Many of Freda’s clients have careers that expose them to industrial chemicals or workplace stress. Freda works with them individually to become aware of their stressors and to learn how to avoid irritants to their skin. Others come in “as if they have 10 bricks on their shoulders.” Freda notes that “what we keep bottled inside shows on our skin over time,” sometimes appearing as rosacea, rashes, or acne. For Freda, treating skin by necessity means focusing overall on wellness. Freda’s passion for wellness extends through her background in nursing and her time at the Steiner Institute of Esthetics. There, skin care and health became her vision. Soon, she was conducting late-night research and pushing for beauty and radiance built on holistic health – a zeal she carries forward in her business. “Stress level today is probably the worst I’ve ever seen,” says Freda. “Self-care and self-love are the two biggest things I speak to clients about.” Finding space for relaxation and celebrating the good things in the lives of her clients are a huge part of the services she provides. Freda Jackson of Freda’s Skin Studio in Waynesboro. Photo by Norm Shafer. Since coming to Waynesboro, she found and helped build a strong network of local businesses. She’s part of am emerging wedding industry in Waynesboro that includes businesses like White Dress by Greta Kay and The Faded Poppy. Birdseed Yoga is also nearby for healing and relaxation. Long term, Freda’s goal is not just to grow her business but to grow a wellness center comprised of independent, client-focused entrepreneurs. 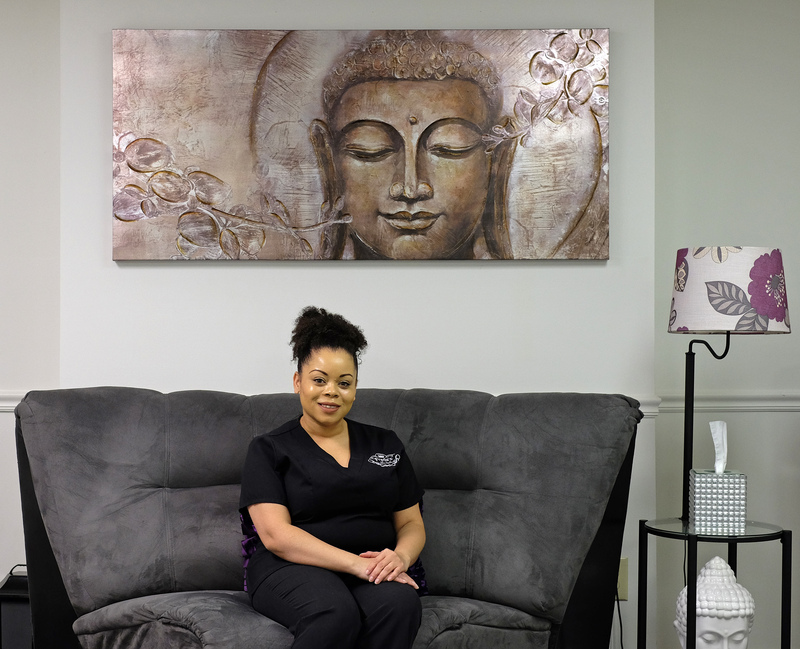 She has already begun through partnerships like the one she has with Jennifer Kupiec of Waynesboro Massage, who provides massage services in the same location as Freda Skin Studio. Her approach is working. As more clients share their appreciation of her services by word of mouth, she now has new clients coming from Roanoke, Lexington, and Lynchburg, becoming a destination in her own right. For Freda, one of the benefits of entrepreneurship has been the freedom to pursue investments in her business that most benefit her clients. She has purchased an advanced skin scanner, for example, to analyze individual skin conditions and to customize treatments for the needs of eac, unique client. Pursuing and ultimately achieving results for clients who have struggled with chronic issues for years is clearly part of what pushes Freda forward. Continuing education, customized product lines, and ongoing health research comprise typical parts of her daily business. Freda Jackson works on a client at her business, Freda’s Skin Studio in Waynesboro. Photo by Norm Shafer.